But many swigs of coconut iced coffee (coming up next post!) and a pretty big accomplishment (for me at least) later, my mojo turned up on our doorstep, bearing one perfect corn on the cob. 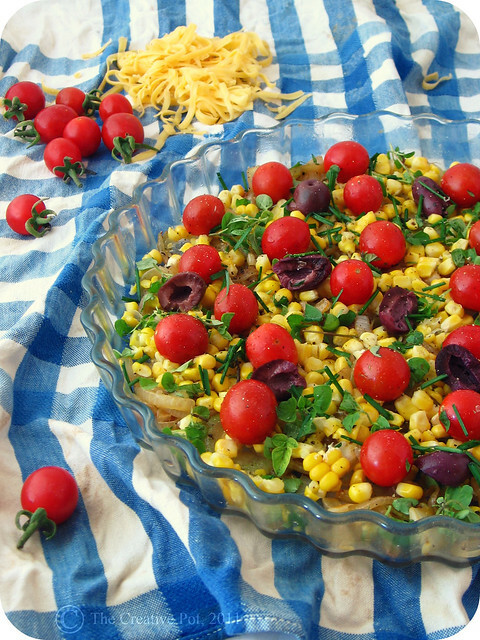 One of the first of the season - screw tomatoes, corn is where it's at for summer. I absolutely adore the smell of freshly cooked corn, reminiscent of a just-mown lawn. Peeling off the husk before greedily sinking my teeth into the tiny kernels, ripping them off the cob with wanton delight. Preferably with butter dripping down my chin. This time though, I felt like incorporating the sugary sweet kernels in a savoury tart. A good old "souttert", the way mom used to make it. Sans the viennas - hey don't you go judging my mama - and with a few added spoils of the season. Perfectly round cherry tomatoes, slivers of sauteed onion, a handful of fresh herbs from the garden and of course a nice hunk of cheese. The perfect Sunday night supper. And even more apt for Meatless Monday. Go on, make it, eat it and marvel over the chock-full-o-veg goodness of it. You can thank me later. 1. Preheat oven to 180C. Heat olive oil in a small saucepan, add onions and saute for 10 minutes or until lightly browned and softened. 2. Meanwhile, steam corn in its husk, until fully cooked. Remove husk and then, using a knife, cut the kernels off of the cob, discarding the cob. 3. Lightly grease a round tart pan, then evenly distribute the onions over the base. 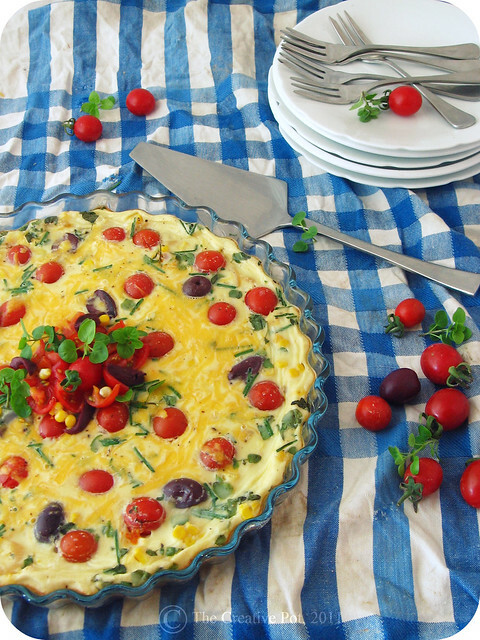 Follow with corn kernels, whole cherry tomatoes and finally the olives. Scatter oregano and chives over and season with salt and pepper. 4. In a large mixing bowl, beat eggs until frothy, then add flour and milk, beating again until there are no more lumps. Add salt and pepper, as well as the cheese and stir through to combine. 5. Pour egg mixture over the corn, tomato and olive mixture in the tart pan, then place in the oven and bake 20 - 25 minutes or until set. Allow to cool slightly, then cut into wedges and serve with a side salad. Try using different herbs - perhaps some basil or even woody rosemary - or a special cheese. A splash of balsamic vinegar definitely wouldn't be a horrible thing either. What a colourful and lovely looking tart. Another beautiful creation... Now you have me SO pining for a quiche (tart, whatever). I forget it's summer where you are. How lucky! I like the way you've put the tomatoes on top...looks very fresh. Yay, I have been waiting for a delicious Creative Pot recipe! This looks so gorgeous - I loved getting my tomatoes and my mielie... I first called him Melvin the Mielie and then promptly ate him in a stirfry. BUT I'll get another and make this yummy tart! Dit lyk beautiful! Ek verstaan die mojo-ding, voel tans nogal baie dieselfde. I see how it is. You get some beautiful corn, which I won't see again for another few months, and it lifts up your spirit...and what am I to do? Sigh. Yummiee!!! Dit lyk sooo ooo ooo lekker!! We have yet to find *our* blogging mojo! =) I blame weird my weird schedule.